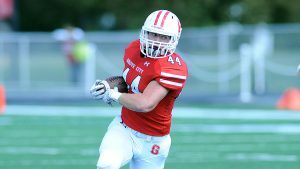 Rob Kunst, a senior Finance major and Analytics minor, has played football all four years during his time at Grove City College. He began playing his junior year of high school, sparking his passion for the sport. 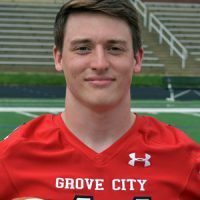 Rob’s decision to play college football was inspired by his two uncles, alumni football players from Grove City. His dad also played football during his time at California University of Pennsylvania. “I knew playing football in college wasn’t going to be easy, and as crazy as it sounds, I think that’s why I did it. I wanted to be pushed, tested, and have an opportunity to learn lessons that can’t be taught in a classroom,” Rob explained. He specifically chose to come to Grove City College for the academic reputation, religious atmosphere, friendly culture, and strong alumni network. Coach Chris Smith, the College’s head coach on the previous staff, recruited Rob four years ago, along with coaching his two uncles way back when. In high school, Rob played tight end and inside linebacker. He came to college as a tight end but has evolved into a tight end and wide receiver hybrid. Rob discussed his football season schedule, as it is a year-round commitment. For pre-season, players receive an optional summer training book with detailed regimen regarding lifting, running, conditioning, and nutrition. With three years of past summer internships, Rob was challenged with fitting training into a structured 40-hour work week. He worked hard to start his days at 5:30 in the morning for training before work, a process that eventually came naturally in his day to day life. After a rigorous routine of “eat-sleep-football” during August football camp, the season begins … but so does school. 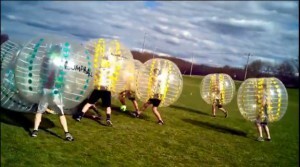 Football is six days per week, including games on Saturdays, until about mid-November. Balancing football and school is not easy, but Rob found a way to stay organized and use prioritization skills daily. The post/off season begins with lifting after Thanksgiving, leading into the spring semester of school. After months of daily training, April brings Spring Ball, a time where the NCAA permits team practices on the field three days per week for five weeks. In addition to the training and practicing in the spring, there are also team meetings one night per week that include senior leadership training. Head coach Andrew DiDonato has been a huge blessing for Rob; he has a positive mindset no matter the situation, takes responsibility for all of his actions, strives for a successful life, finds joy in helping others, and works effectively even with challenges. “One of the biggest lessons in faith has been that true, overflowing, and everlasting joy comes from a meaningful relationship with God. If that’s what fuels my fulfillment and happiness, then there’s nothing in this world that can take my joy away. Living this out has changed my life and strengthened my walk with Christ,” Rob said. 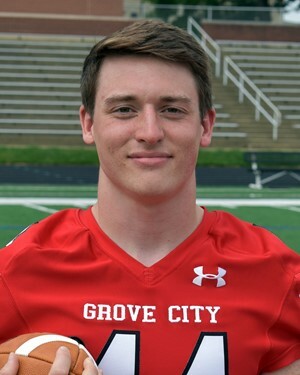 Although Rob will not develop his football career after college, he plans to support coach DiDonato and the Grove City College football program in any way he can. “I have already began to apply lessons to academics, my career, and relationships. I would say that the most significant impact has been on my early career. To provide some context, I came into Grove City’s football program in the pit of its 33-game losing streak. There’s nothing fun about being part of a losing streak, but the experience of working towards ending one is priceless. Living out this challenge was the closest simulation I had to turning around a failing company in the business world. With that in mind, the lessons preached by successful entrepreneurs and business influencers about building a prosperous business align closely with the lessons that we had to implement as a team to improve our success. Therefore, these skills have been highly applicable to a business setting and have already helped me to succeed in several different business/finance internships and secure a full-time position with an exceptional company in August of 2018 – before even stepping foot on Grove City’s campus as a senior. These lessons aren’t a secret, and they’re not ‘life hacks.’ They just require necessary discipline to live out and follow every day,” Rob said. After graduation, Rob will be based in New York City and can help large companies solve complex business issues as a consultant at Protiviti, a global management consulting firm that helps its clients solve problems in areas like business process, analytics, internal audit, and technology. Rob’s goal to become a consultant stems from being a part of the transformation that is taking place within Grove City College’s football program. He wants to help companies, managers, and executives become better at what they do, along with reaching their goals. Rob is excited to have the opportunity to help and grow with Protiviti. He thanks his influential professors, coaches, internship colleagues, members of the Career Services Office, and quality friends for the constant support and compassion.